Salmagundi was a short-lived periodical written by Washington Irving with the help of his brother. Much like the letters of Jonathan Oldstyle, the Salmagundi was a cooperative effort between the Irving brothers. The articles in each issue are extremely varied, including poetry, stories, commentary by the editor “Launcelot Langstaff” or the Captain of a Ketch, “Mustapha Rub-a-Dub Keli Khan,” or other sketches and stories. Many of these characters are drawn from Irving’s life and social circle. In spirit they remind the reader of the letters of Jonathan Oldstyle in that they are a reflection of a culture coming to know democracy and eager to debate the profound, the serious, and the mundane within the commons. 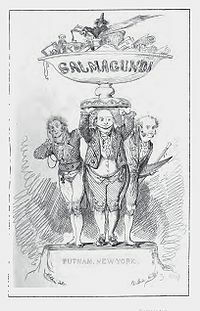 As much as the Federalist Papers, the Salmagundi is a product of the American Revolution, and the emerging unique American political and cultural identity. It should be more commonly studied, in part because reading them is so pleasurable. The completed Salmagundi consists of twenty issues, published over a little over a year (January 24, 1807 to January 25, 1808). They are all divided into a few parts and each total around 15 pages each (I am not sure how much each issue would have been in the original type). They were meant to be read in short bits, probably in the company of others or in a public space. The “public use of reason” fills up every page. They are essentially political documents, posing as social satire. Most issues open with commentary by Launcelot Langstaff, introducing the characters that have submitted articles and occasionally talking about his encounters with various denizens of the city, focusing on their conversations about politics and social life. We can notice a few things about these commentaries. First, Langstaff is interested in publicizing private conversations, although they are fictional, they seem to be rooted in real experiences and considerations of the day. In the age of universal surveillance, much has been said about the importance of privacy and the unjust interference into private lives. On the other side of the question is the necessity of a vibrant public life that seems to undermine privacy for the public good. We accept this for public figures. Their affairs and hypocrisy are considered socially relevant in a democratic society. Does this not privilege those leaders? Suggesting that they are more important to a democracy than the average person. I wonder if there is a larger argument to be had about the role of the privacy, the commons, and public discourse. Better to have your private life exposed than to lose the commons of public discourse. As a piece of evidence that that authors of the Salmagundi hold no private thoughts sacred, consider the February 24, 1807 edition, which has at its core the exposure and publication (without consent it seems) of the private travelogue of one Jeremy Cockloft, the Younger. The only justification for this invasion of his privacy is that the notes “may not prove uninteresting to my readers.” (94) This journal is exposed with the same irreverence as the day-to-day oddities of the New York Assembly Hall. Despite saying later that “whether we write, or not write, to be none of the public’s business,” the authors are shameless in putting nearly everything they can into the public record. (189) Mustapha Rub-a-Dub makes a comment in one of his letters arguing that all people want their place in the sun, if only for a moment. As a text, the Salmagundi suggest that this was possible in a democratic society. Yet for all the mockery and fun and satire of the Salmagundi it a celebration of a young republic and the democracy that was being lived out on the streets and public spaces. It also broached serious political and international questions such as women’s rights, suffrage, impressment at the seas, government corruption, and even social class.